12-month Lynda.com licenses to the first 20,000 members who register! Lynda.com licenses are still available! SEIU 721’s Joint Million Dollar Training Committee is pleased to announce the availability of a new learning opportunity for SEIU 721 LA County members! 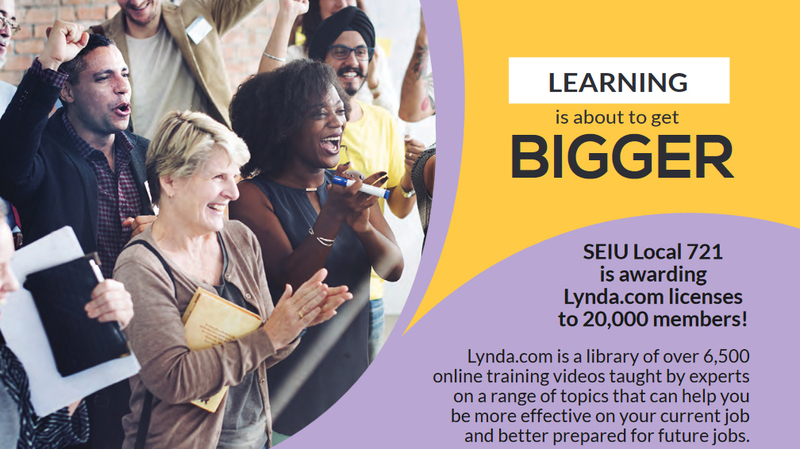 We are granting 12-month Lynda.com licenses to the first 20,000 members who register! In case you haven’t heard, Lynda.com is one of the most highly sought after resources for online training. Helping you achieve your professional development goals – now and in the future – is what this opportunity is all about! The flyer below provides details and information, including requirements about the use of the Lynda license during regular work hours. The link to register for this opportunity is live! Hello, I was selected as one of the 20,000 for the Lynda License. I downloaded the flyer etc… I want to start utilizing this feature, but have no clue how. Will someone contact me, thanks.